Tender strips of chicken, and hot, crisp vegetables are combined with an Asian inspired sauce in this Ginger Chicken and Broccoli Stir Fry. This is one of the easiest and most popular ways that I get dinner on the table. 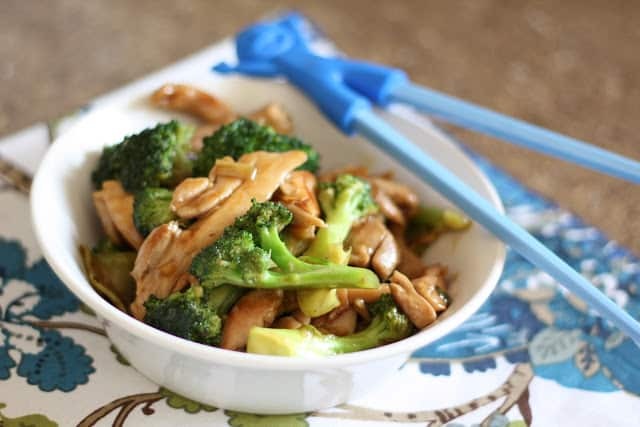 Broccoli is one of my favorite vegetables to use in a stir fry. The florets hold so much sauce and each bite is full of flavor. The oyster sauce in this recipe also adds a savory note that we enjoy. Ginger is one of the ingredients I tend to use most often for stir fry recipes. It is such a great addition to chicken and vegetable stir fries. 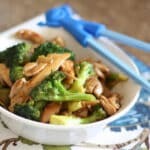 Most of our Asian dishes incorporate a bit of heat or spice however, this Ginger Chicken and Broccoli Stir Fry is a very flavorful dish that my whole family enjoyed without any heat at all. If your kids are new to Asian foods and they might like to try chopsticks, these are the best ever training chopsticks. Start with a wok or a large deep skillet to stir-fry. I’ve tried classic woks, countless skillets, and frying pans over the years. I now use this everyday pan to stir-fry and I absolutely love it. I typically use tongs or a fish spatula for stir-frying. You can use any sturdy wooden or metal spatula, but fish spatulas really are the ultimate turner, stirrer, stir-fry tool. Cut similar ingredients roughly the same size. Smaller pieces will cook faster, so making sure things are similar will keep things cooking evenly. If you like ginger as much as I do, you’ll want to check out all of these tasty dinner ideas. Gooey Ginger Chicken by A Family Feast is a stir fry filled with tender chunks of chicken are served in a sauce that is both sweet and spicy. Served over simple Asian rice, this is a meal the whole family will love. Chinese Chicken Salad with Ginger Sesame Dressing is a light and flavor filled salad that is loaded with flavor. These Huli Huli Chicken Bites can be on your table in about 20 minutes and the garlicky ginger flavor can’t be beat. I like to serve them with Pineapple Rice. Maple Ginger Chicken Thighs are a fantastic main dish that would be delicious with garlic smashed potatoes or roasted vegetables. In the mood to grill tonight? Try these Soy Ginger Chicken Kabobs with a vegetable salad or a creamy pasta salad. 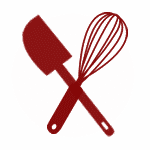 Whisk together the oyster sauce, soy sauce, rice vinegar, sesame oil and arrowroot. Set aside. In a very large skillet or wok, warm the oil over high heat. Add the chicken and cook, stirring or tossing frequently, until it is browned, about 10 minutes. Add the ginger, green onions, garlic, broccoli and mushrooms if desired. 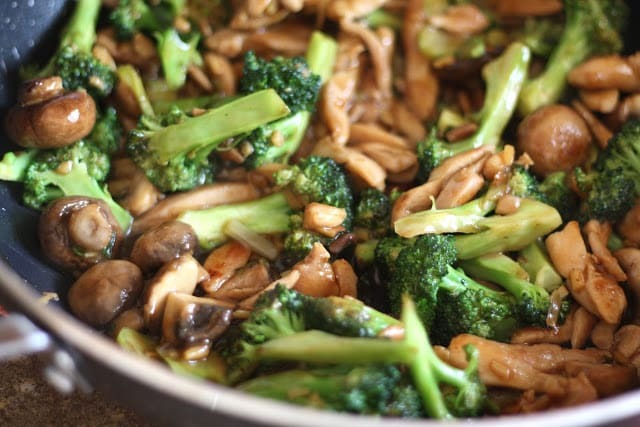 Cook, stirring or tossing constantly, until the pan is fragrant and the broccoli turns bright green, about 2-3 minutes. Add water to the mixture and use a wooden spoon or spatula to scrape up all the browned bits. Pour in the soy sauce mixture. Cook, stirring constantly, until it thickens, about 1 minute. In a very large skillet or wok, warm the oil over high heat. Add the chicken and cook, stirring or tossing frequently, until it is browned, about 10 minutes. Add the ginger, green onions, garlic, broccoli and mushrooms if desired. Cook, stirring or tossing constantly, until the pan is fragrant and the broccoli turns bright green, about 2-3 minutes. Add water to the mixture and use a wooden spoon or spatula to scrape up all the browned bits. Pour in the soy sauce mixture. Cook, stirring constantly, until it thickens, about 1 minute. Serve over rice if desired. Enjoy!